Did you guys see that comment-voting is back? Are you relieved that we’ll be back to the regular Shut Up, Dude! format at the end of the week? We have to give it up for Scott, though, who did his best to assuage the pain and that was via two pretty incredible round-ups of the week’s news via animated gif. If a tiny little part of you is going to miss that, today’s your day. 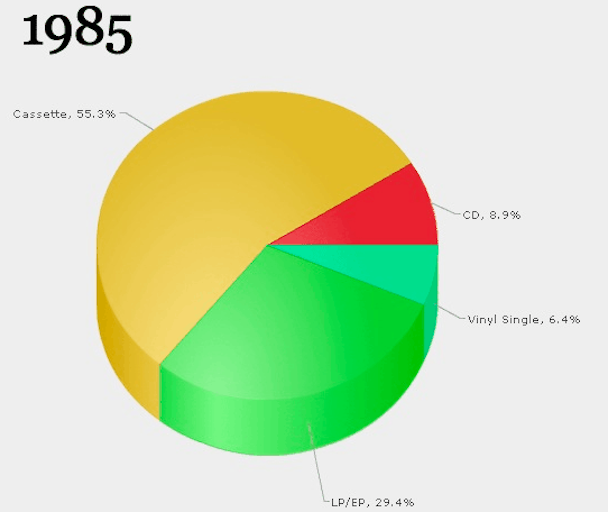 Below, check out a 40-second look gif from Digital Music News that shows an evolving pie chart of how music was purchased in 1973 through the present. Learn about the decline of vinyl, the dominance of the CD, and how digital consumption continues to expand.